The sixth book of the Iliad includes some of the most memorable and best-loved episodes in the whole poem: it holds meaning and interest for many different people, not just students of ancient Greek. Book 6 describes how Glaukos and Diomedes, though fighting on opposite sides, recognise an ancient bond of hospitality and exchange gifts on the battlefield. It then follows Hector as he enters the city of Troy and meets the most important people in his life: his mother, Helen and Paris, and finally his wife and baby son. It is above all through the loving and fraught encounter between Hector and Andromache that Homer exposes the horror of war. This edition is suitable for undergraduates at all levels, and students in the upper forms of schools. The Introduction requires no knowledge of Greek and is intended for all readers interested in Homer. 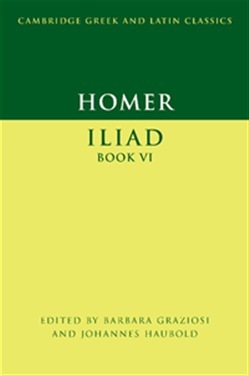 Acquista Homer: Iliad Book VI in Epub: dopo aver letto l’ebook Homer: Iliad Book VI di ti invitiamo a lasciarci una Recensione qui sotto: sarà utile agli utenti che non abbiano ancora letto questo libro e che vogliano avere delle opinioni altrui. L’opinione su di un libro è molto soggettiva e per questo leggere eventuali recensioni negative non ci dovrà frenare dall’acquisto, anzi dovrà spingerci ad acquistare il libro in fretta per poter dire la nostra ed eventualmente smentire quanto commentato da altri, contribuendo ad arricchire più possibile i commenti e dare sempre più spunti di confronto al pubblico online.